Went on a day trip down to the City of Brotherly Love for a walkabout. I thought New York City was interesting, but Philly is coming in at a close second to it. I saw some very interesting people hanging on the streets in Center City. If you have a chance to get the Philadelphia even for a couple of hours you should the amount of history the city has plus the the people who inhabit the city will make it worth the trip. This is an old shot that I came across while doing Lightroom maintenance. Year after year you can see people who love New York City during Christmas for the lights, Rockefeller Centers giant Christmas Tree and the window scenes at some flagship department stores, but The Village Halloween Parade beats all that by a mile and it your are planning a holiday to New York City might I suggest the end of October. New bag from Mountainsmith to cut down on what I’m carrying on walkabouts. Picked up a hiking waist bag REI to repurpose it into a camera bag. If you every happen to see this gentleman say hello. His is the friendliest bus driver you will ever meet even on a Sunday morning during a walk of shame! I hear all sorts of negativity about using a high IOS because it will ruin you shot, but that is the opinion of the person making the comment. I will take the shot not matter what ISO my camera is on just so I can get the shot, I will try to make sure it is a low as possible, but sometimes you don’t have a choice. This is an old shot I took a few years back on one of the early morning walkabouts. Seeing the city wake up on a Monday morning it quite entertaining. I was joining a couple friends for a pint in Jersey City when it started pouring out and I saw this man walking I assume at the end of his work day ready to start his weekend and I just had to take the shot. I have the luck of knowing some very talented people and with that I have been giving some exclusive entry into the minds of these people. In this photo is Emmanuel Reyes a good friend and a talent in his own right who has been putting in the hours to master his craft of tattooing. 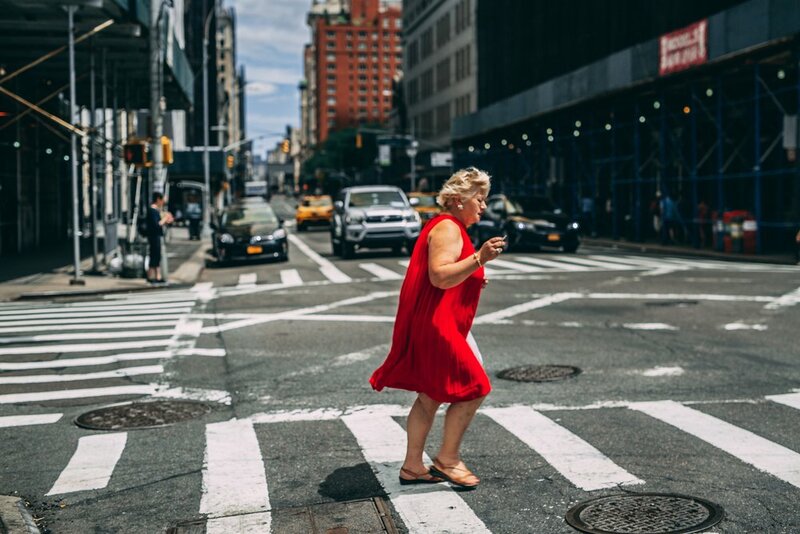 I once heard a photographer say there is a trifecta street shot that would be his holy gail of shots and it would be an older women in a house coat smoking a cigarette pushing a baby carriage and I think I got pretty close that with this one. She did give me a dirty look and message after I took the shot, but that is something to be expected when you out shooting street photography. If you from New York City or visit on holiday you will inevitably see something you thought you would never see on a city street. Hit 60 degrees last week and the city came back to life.